These were some of the College-wide accomplishments that President José Luis Cruz cited during the Convocation 2018 ceremony held at the Monroe and Rose D. Lovinger Theatre on September 12. 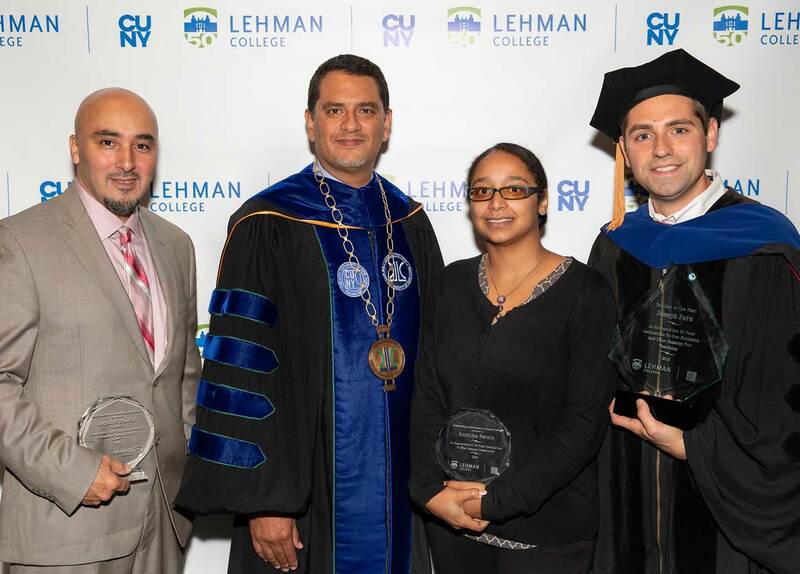 Joined by regalia-clad faculty and administrators, plus staff members and students, Dr. Cruz officially launched Lehman College’s 2018-2019 academic year and offered his remarks as part of a program that included presentations of awards, musical performances and calls to action. At 919, the Fall 2017 full-time freshman class was Lehman College’s largest in nearly a decade. At 14,130, the Fall 2017 total student enrollment was the College’s highest since 1976. Last year, almost 80 percent of first-time, full-time freshman returned as full-time students—nearly 10 percentage points higher than the CUNY senior college average. The six-year graduation rate for the 2011 cohort of new students increased 8.6 percent from the 2007 cohort—the largest growth rate for CUNY senior colleges in this time frame. Between 2013 and 2017, the number of undergraduate STEM majors nearly doubled at Lehman, the top growth rate in CUNY. The upshot of all this good news? Lehman will be gearing up in 2019 to host "what will in all likelihood be the biggest commencement ceremony in our College’s history," said Dr. Cruz. Additionally, Dr. Cruz mentioned the recent report on student debt relative to mid-career income in Forbes that ranked Lehman as one of only four public colleges in the top 25 of "low-debt / high-income" schools; and a new Chronicle of Higher Education ranking of Lehman as third in the country for helping students "whose parents were in the bottom 20 percent of income level reach the top 20 percent for individual earnings." But more work lies ahead in helping Bronx residents and others reach their full potential, Dr. Cruz cautioned, so he again asked the Lehman community "to roll up our sleeves, sharpen our focus, open our hearts, steel our resolve, and get the job done." After a solo vocal and piano performance of “Believe in Yourself” from The Wiz by Music major Justin Kelly ’20, the College-wide awards were presented. Dr. Joseph Fera, deputy chair and assistant professor in the Department of Mathematics, who also presided over the ceremony, earned the Teacher of the Year accolade. Both Anyelina Fermin, college assistant in the Department of English, and Richard Santapau, custodial supervisor in the Department of Buildings & Grounds, were presented the President’s Award for Outstanding Contributions to the College. Daisy Flores, president of the Student Government Association and a Dietetics, Foods & Nutrition major set to graduate in 2019, closed the ceremony. She recalled visiting the Lehman campus as a four-year-old with her aunt, who was studying accounting. She snuck into classrooms, pretended to be an adjunct professor, and learned how to write her name by practicing on blackboards. In this way, Flores said, Lehman “marked the start” of her educational journey and passion for learning. Flores, who is mentoring other students in the Herbert H. Lehman Leadership Program, added, "Lehman is more than just a learning institution. Life happens here. Change happens here…I ask all of you: what role will you play in helping students succeed? I challenge all faculty, administrators, and staff to be part of your students’ success journey. Reach out and become invested in our students and I can assure you, you will not be disappointed." Processional and recessional music was performed by the Lehman Student Jazz Ensemble under the direction of Allan Molnar, professor and director in the Department of Music, Multimedia, Theatre & Dance.